How often do we think about our smile? Isn't it just another part of our being, a part of what we've been given like our hair colour or our height? Well, yes and no. your smile is one of the first and most important things people notice about you. It can portray many things; self-confidence even strength of character. It is truly difficult to over-estimate the importance and impact your smile can have in your life. Each individual that comes to us has unique concerns and our dental team uses the artistry of dental smile solutions to design the perfect smile just for you. Our pursuit of excellence in all areas of patient care is the measure of our success. Each day we see the difference a beautiful smile can make. That's why we are proud to consistently exceed the expectations of our patients. 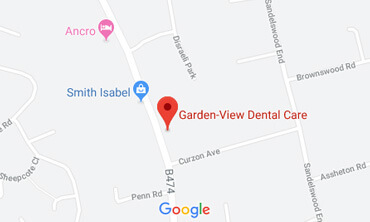 At Garden View Dental Care our Dentists in Beaconsfield, believe in treating the whole patient and that means taking the time to get to know you and involve you in designing a personalised treatment plan. So whether you are looking for general dental work or Cosmetic Dentistry such as implants, veneers, teeth whitening or Six Month Smiles, also If you are looking for an Emergency Dentist in Buckinghamshire contact us today. Upon arrival for your appointment please feel free to relax on our sofas and armchairs in the air-conditioned or heated reception area. We have a wide variety of the latest magazines/newspapers, free wi-fi and a choice of hot beverages available while you wait. If you have an emergency, please call us as soon as possible and we will endeavour to see you the same day. Garden View Dental Care is located at 54 Penn Road, Beaconsfield, HP9 2LS. We have a car park outside the practice and are ground floor based, with disabled access to both surgeries. Dr Makhani was recommended to me by one friend and I'm very pleased with the treatment I received. I'm very happy with the results. In my view it is a very high quality, professionally run dental practice which provides excellent advice, treatment and friendly atmosphere. I will highly recommend it to anyone.